Gift certificates can be printed to be given in person, or they can be emailed directly to the recipient...your choice! 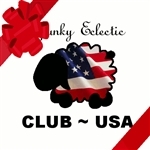 Give the gift of the Spunky Fiber Club! The Spunky Fiber Club delivers a brand new, never seen before, specially created Spunky Eclectic colorway on different fibers every month! So you want to learn to spin? You've come to the right place. We've made a kit for you that pairs up a spindle with easy to spin fiber and simple instructions. 1 set of instructions on how to use. This is a kit in Cottolin - Tan with white and black. The warp is prewound. YES, that's right, the warp is measured and ready to put on your loom. Ship from factory if not in stock in Maine. Generally a 1-2 week lead time. Double Drive High Speed Bobbin. Ship from factory if not in stock in Maine. Generally a 1-2 week lead time. Schacht's standard bobbin with a plastic core. These fit the Matchless, Ladybug, Flat Iron, and Sidekick. Schacht's standard All wood bobbin. These fit the Matchless, Ladybug and Sidekick. In the photo it's the darker of the 2 bobbins. In stock - ships from Maine - back ordered items will be drop shipped from the factory. Lead time is 4-6 weeks. Strauch's Jumbo Ball Winder. It's a class all in its own. If you need to wind yarn (small or super large skeins) then this is the ultimate ball winder have. If you've used the plastic winders, this one will be so much better. If you're winding yarn by hand, this is certainly going to be luxurious. If in stock it ships from Maine. Back orders are drop shipped from the factory in 6-10 days. The long needle point of the Schacht oil bottle is ideal for getting to all those hard-to-reach places on spinning wheels and other small machines. Filled with 1/2 oz. of motor oil. The fluffy Spunky sheep on an oval 5.5" x 3.5" bumper sticker. All of the money for these, every penny of both dollars. will be donated to the National 4-H Council to help fund their continuing work with youth development. They have received Charity Navigator's highest rating of four stars. They just do wonderful things and we are proud to support them. The travel bobbin was designed especially for the Sidekick, and is compatible with the Ladybug and Matchless spinning wheels. 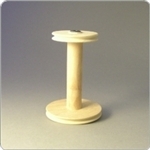 With molded plastic flanges, the travel bobbin is durable and affordable. In stock - ships from Maine - back ordered items will be drop shipped from the factory. Lead time is 4-6 weeks. Schacht's bulky All wood bobbin. These fit the Matchless, Ladybug and Sidekick that are set up with the bulky maiden and flyer. Weaving kit for the Subtle Tartan Cowl. Weaving kit for the "Spaced" Cowl. Jul Designs "String of Beads" shawl pin. Jul Designs "Moire" shawl pin. Made in the USA Jul Designs Stone in the Water" shawl pin. Fair Trade made in Indonesia Jul Designs unique "Venetian Hinge Closure". To use this - remove the screws and leather washers. Position on your garment and gently work through from the front. On the back side, replace the washers and finger tighten the screws. Voila! It's that easy. Jul Designs unique "French Curve Leather Closure". To use this - remove the screws and leather washers. Position on your garment and gently work through from the front. On the back side, replace the washers and finger tighten the screws. Voila! It's that easy. Deeper clamp for Strauch's Jumbo Ball Winder. The photo shows the difference in the one that comes with the winder and the deeper one.